I thought I had a pretty good plan, with a couple of back-up places to camp at higher elevations in case the heat got to us. But unfortunately, and fortunately, tunnel-vision and exhaustion made the decision for me. 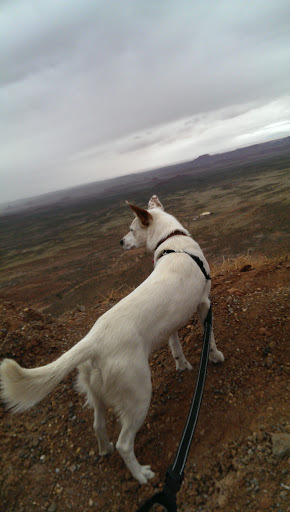 1) Get that photo of Muley Point for my (step)dad like I’d promised last time I went up there. 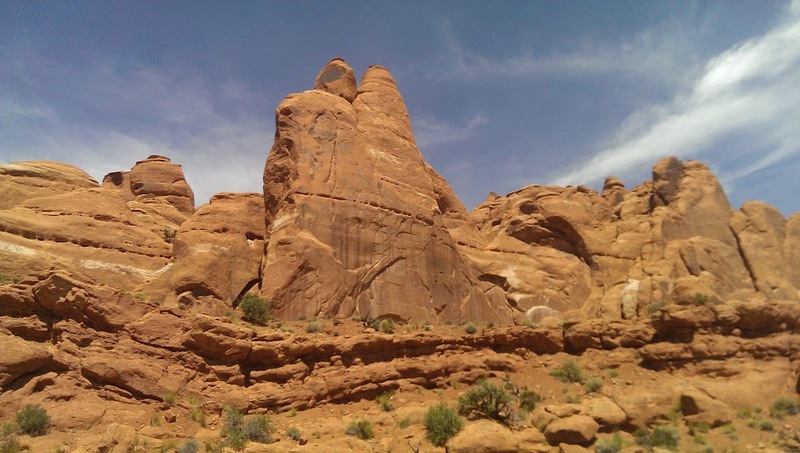 2) Travel the road into Arches to Balanced Rock that Ed Abbey talked about in Desert Solitaire. The original entrance into Arches BLM 378 Willow Spring Road. 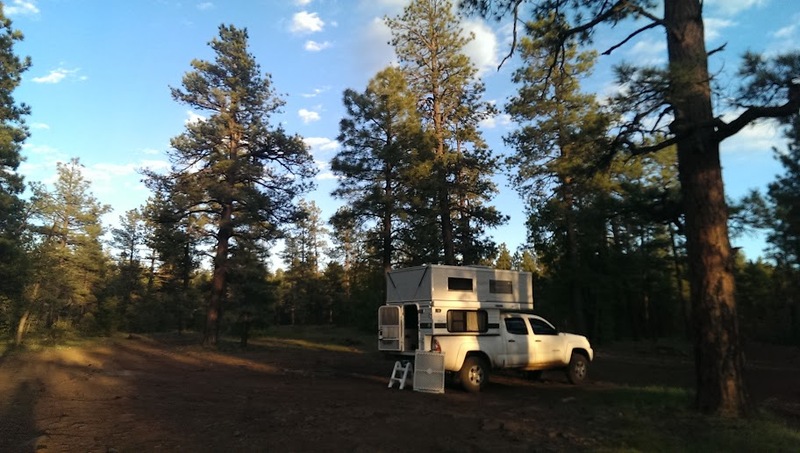 The first night, I camped at one of my favorite-not-too-far-from-home places to camp out near Munds Park, AZ. It was lovely, protected, and still had an amazing view. That’s Monument Valley out there! 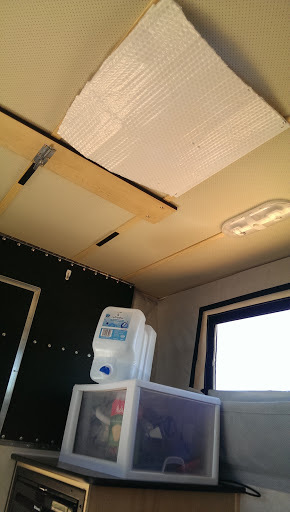 Because it was so warm, I stayed inside and got some little projects done in the camper. Added Velcro to under the runner rug so it will stop scootching up. 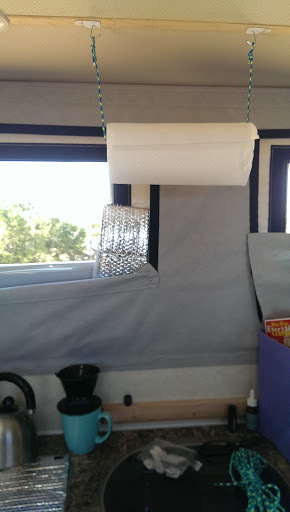 Cut out a reflector and added Velcro to keep sunlight from streaming in the ceiling fan. I wondered if I could put in a skylight instead of fan over my bed? 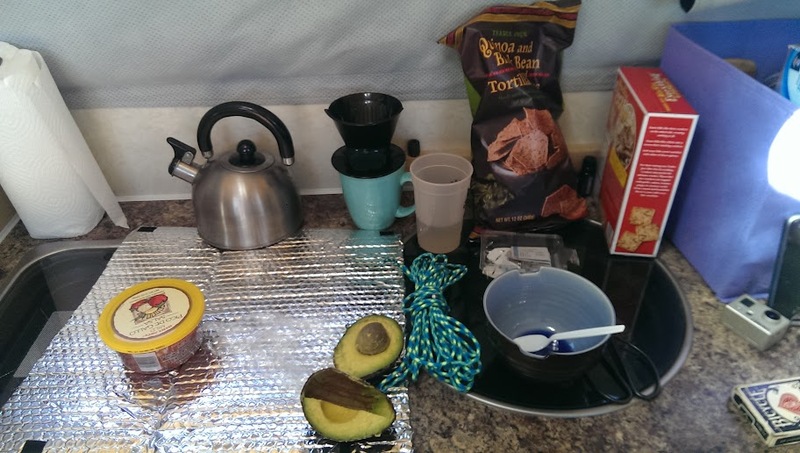 Made a lunch of guacamole while working on the projects. Wondered about changing out my sink faucet with on that swivels, as well as goes up/down? 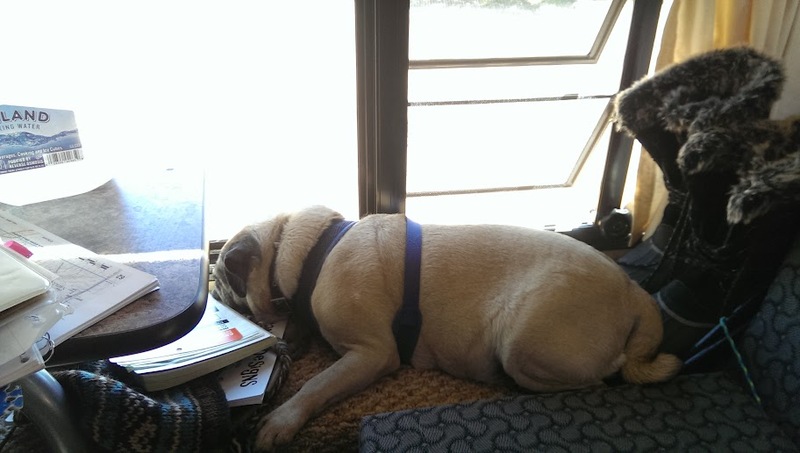 Pugsly’s favorite napping spot. Need to organize that for her better. 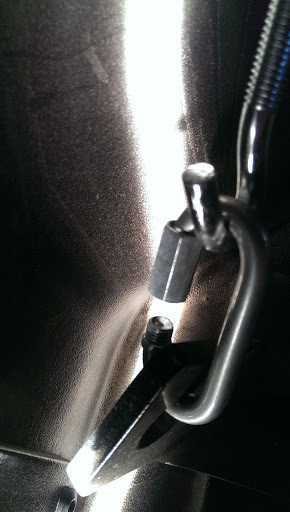 Did my routine check of the turnbuckles and much to my surprise, one of the fasteners was loose! Eep! Chris, from Rocky Mountain FWC, recommended adding blue Loctite. I’m going to pick some up today! 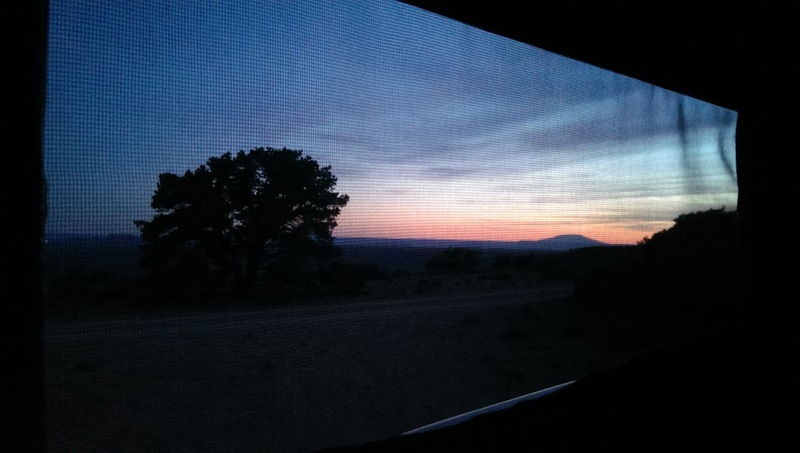 Unfortunately, there were bitey gnats that drove us inside the camper to spend some time viewing the sunset through the mesh. Still, not too shabby! and the second, was that I couldn’t see where the “road” went after the wash. I got out to scout, and saw some faint tire tracks so thought it angled off to the right. This is looking back to the truck from where I thought the “road” led across the wash. I sat there for a while, and texted my (unintentional) “navigator” Cayuse, and sent him some pics. He suggested using 4-low to slowly “walk” the truck down the decline. I thought about it, then decided that I wasn’t ready, backed up, and turned the truck around. Feeling like a wussy loser, I paused. While I was in that pause, a Land Cruiser drove by. I decided that if they could do it, so could I! Plus, I could follow them to find the rest of the path. 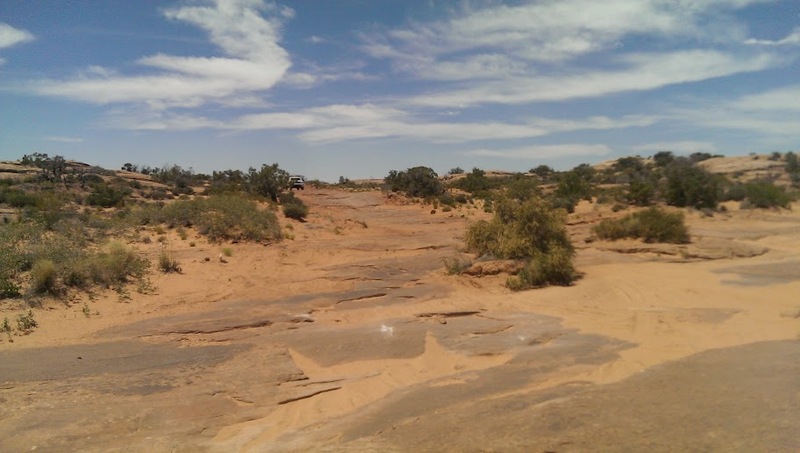 By the time I got turned back around, the Land Cruiser was disappearing behind a left angle of the road beyond the wash. I was correct in my initial assessment of there the road led, so with my confidence up, I slipped into 4L and slowly creeped down that rock. The truck bottom scraped momentarily, but with a smooth transition, I was in crossing the wash and up the other side. What fun! I’m now considering adding an extra leaf. Nothing major, just to get a wee bit more height for next time…. Pugsly slept the whole time. Balanced Rock was disappointing for the reasons why I dislike tourist attractions. This was my view when I pulled into the small parking area. That’s Balanced Rock peeking up from behind the bus. The bus was sitting there, idling, spewing fumes and noise into the lovely view. I skedaddled away from that crowded area, and did a tour of the main attractions. At all of them, people were crawling about like ants. I had to leave. This is near Devil’s Garden. The “dotted” line in the rocks fascinated me. How was that made? Did an alien ship set that top part down on top? Is it removable with internal hinges and there’s actually a whole gnome world inside? The original idea was to boondock at the camping area that starts that original Arches entrance road BLM 378. But I didn’t have the energy to go back over that road, so I made my way back down the 191 to camp. I ended up at Windwhistle Campground. Not boondocking, but it was a lovely place to camp. I wish I’d explored a couple of the red dirt roads that split off into the distance on my drive out to Windwhistle, I much prefer campering away from people and well, civilization. But there is a convenience to having a toilet and trash cans. 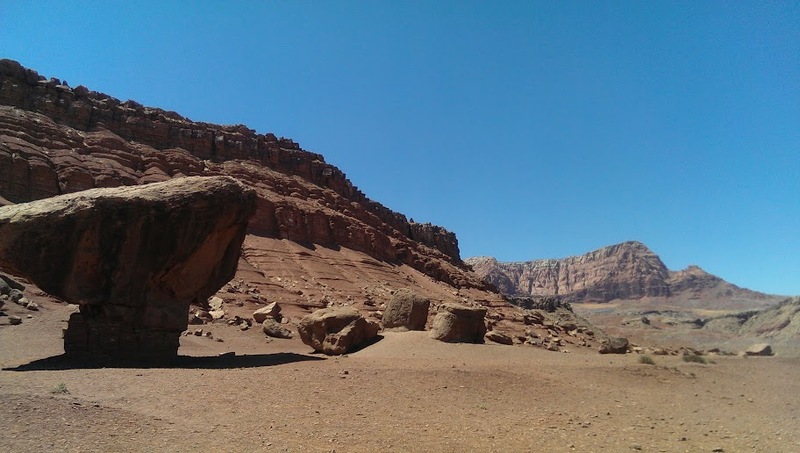 Plus, there were these lovely giant rocks to scramble up behind my site. It was too hot to do much during the day, so I got some reading done. Pugsly got a cool treat (my vet told me to freeze baby food – vegetable turkey for example – and give to pups) Great for a hot day! Around sunset, Argos and I took a wee hike up on the rocks. I found a perfect spot for a tent up there… wish I’d brought mine along, although carrying Pugsly up would have been a trick. You can see my camper just off center, to the left. 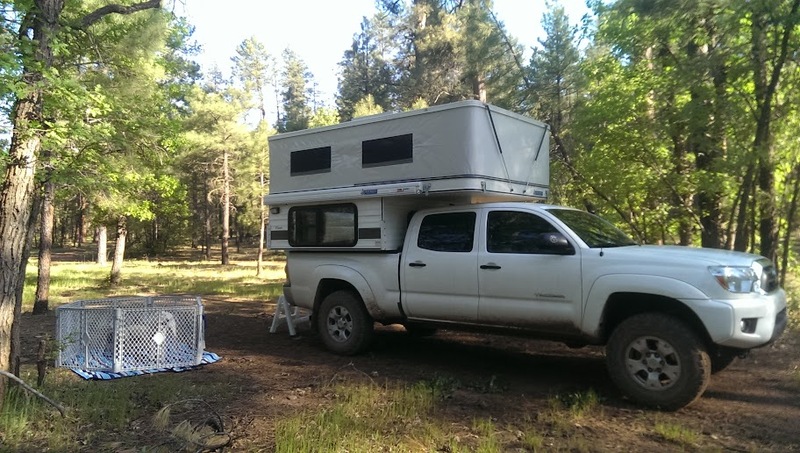 My original back-up plans for “in case of heat” included a couple of higher places near-ish, or to drop down to the Mogollon Rim back in Az. 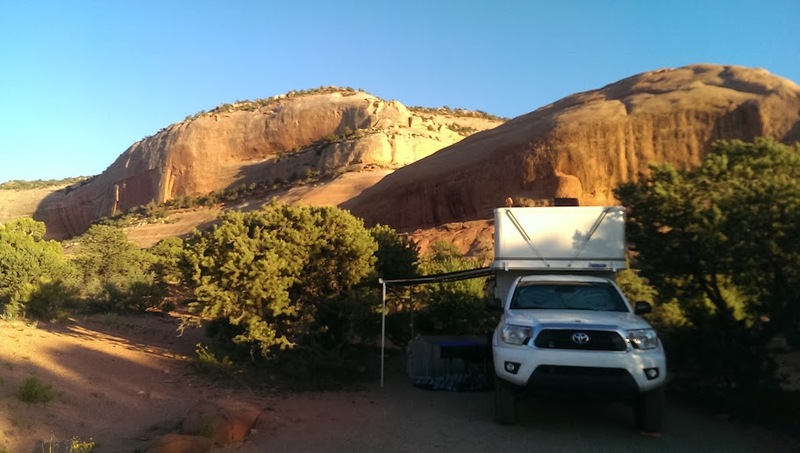 Instead, I headed to Capitol Reef (and on to Escalante) in what turned out to be a grueling and beautiful, and exhausting day of driving more than I’d intended. I was cursing myself, but I also got to scout out places for future trips, and the following day, happened upon a favorite childhood memory. Saturday morning, I first headed to Needles Overlook in Canyonlands. Wow. Just…wow. What amazing earthly forces created these places. At 7:40am I could already feel the heat building. 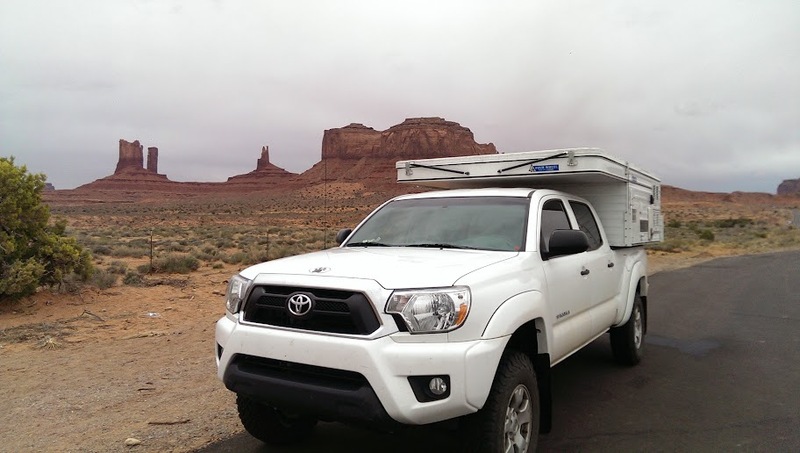 I headed off for my unintentional crazy trip across Utah. 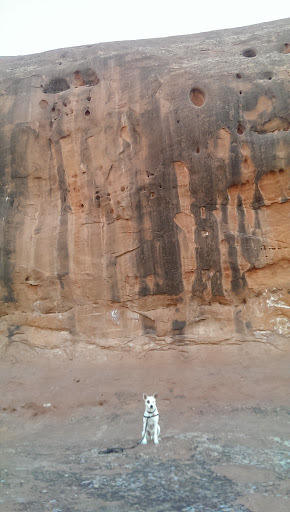 Blanding –> Fry Canyon –> Hite –> Hanksville (the then through armpit of UT) –> Boulder –> Escalante. 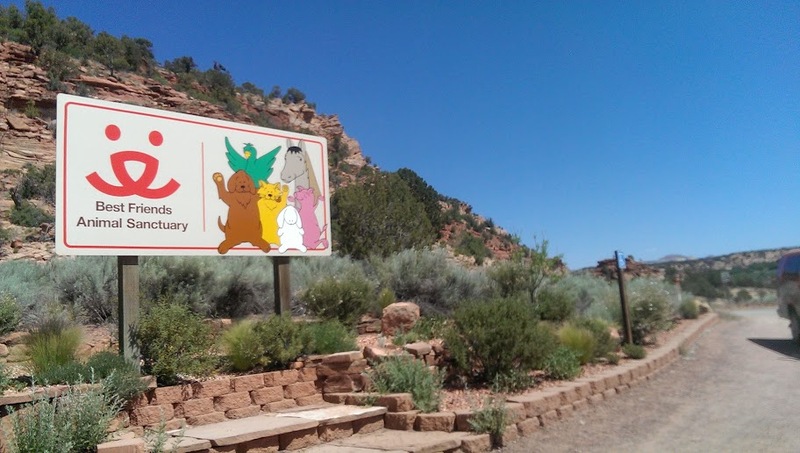 Most of Utah is state parks. It’s pretty amazing. And I should have camped up near Torrey – it was amazingly beautiful, and satisfied my need to get out of the heat. However, and here are lessons to be learned, my stress of Time did not align with my need to be out of the heat. I got tunnel-vision on the Time part of the equation and let that rule my decisions. 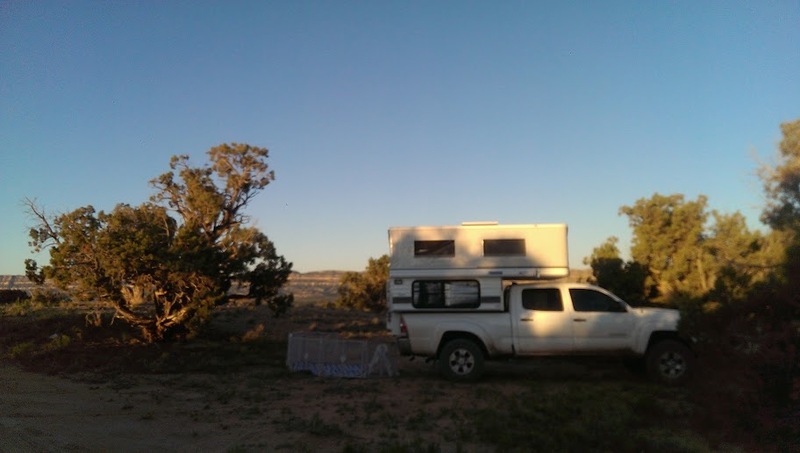 That landed me a full day of driving behind me, outside of Escalante driving down washboard for 14 miles in search of a campground before giving up with worry of my poor turnbuckles and turning around. 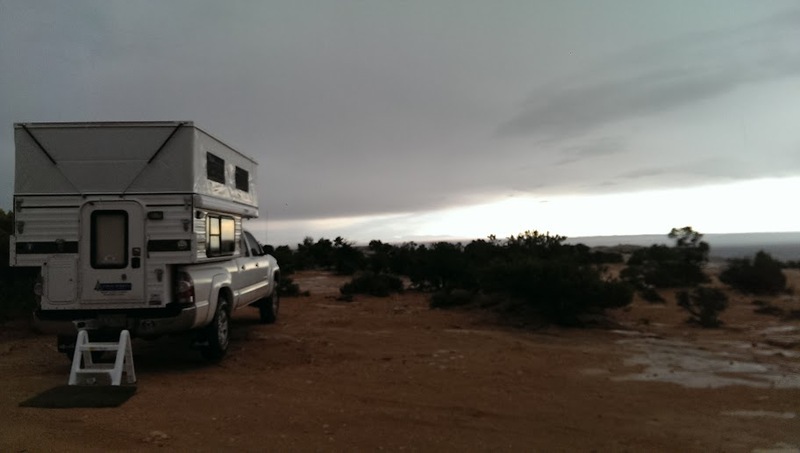 I found a boondocking site closer to the Hole in the Rock turn-off and pulled in there. It was hot and a good portion of that day I felt kind of lost. That feeling of not having your bearings. When I was 15, I visited my cousin in Houston. She took me to Galveston beach front to look at boys. I was excited about the big water and ran in – and got pulled down and topsy-turvy by the undertow. That feeling, of not knowing which was is up and feeling trapped in that place, stayed with me. It’s the feeling I get when exhausted and without a firm grasp on my location, even if I’m at home in my bed. My dad and I used to call it “the existential heebie jeebies”. This time, I reminded myself that I was a day’s drive from my cottage, and not lost on a remote island. Once the heat abated, it was a lovely sunset there outside of Escalante. The dogs and I settled in for a good sleep and woke with the sunrise. As usual, the previous evening’s worries were gone with the fresh morning light. Sunday. Heading back towards my cottage. Since I had another day, and was feeling on the home-stretch, I didn’t have that same frenetic stress as the day before. When I was a kid – 9 or 10 years old – my mom and grandparents and I took a road trip to the Southwest. I was smitten. Grandpa and I peeked under rocks searching for scorpions, I picked sagebrush, and I saw the giant forever skies. One of the stops we made back then, was to an off the main path state park the Coral Pink Sand Dunes. We rolled down those soft pink sand hills and had a glorious time. It is one of my fondest childhood memories. It was a location I’d put on my list to visit. I was surprised to see this sign and immediately turned down the road. My family drove down this road some thirty years ago. I imagine it looks pretty much the same. It was too hot to stay, and so I left the dogs in the truck (running, with a/c), clambered up a hill and buried my feet in the soft, pink sand. I could almost see my grandpa walking barefoot along the crest. After I reluctantly left the Sand Dunes, I stopped in at Best Friends Animal Sanctuary. It’s huge! They have acres of land dedicated for the rescue, rehab, and adopting of animals. Amazing. 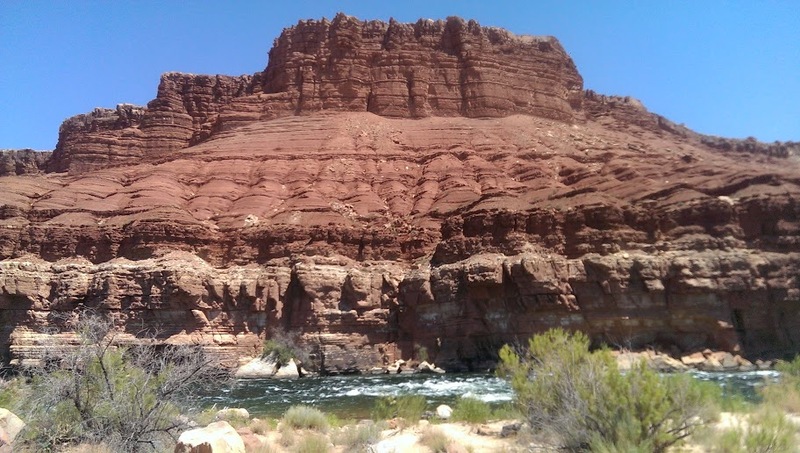 It was too hot to meander, so I left the dogs in the truck (a/c on…) and ran up to the mighty Colorado. Then it was a push on to Munds Park area. After the long, hot trip, it was a relief to find this idyllic little spot away from even the Forest Service road. I arrive home somewhat conflicted as to whether sticking to original plans would have been the better of decisions, or if coming across my childhood memories and some lovely new areas was worth braving the harrowing heat and long drive times? Either way, it was an adventure. And that’s what it’s all about, isn’t it? 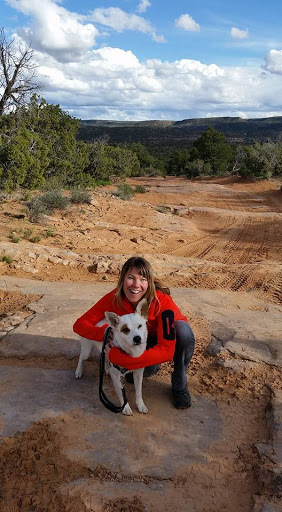 After plans fell through for a long weekend in California campering, I decided to head up to my beloved Southern Utah and visit Abbeyland with the dogs. 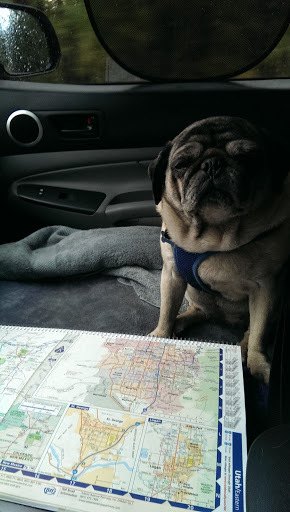 Pugsly was an excellent navigator. 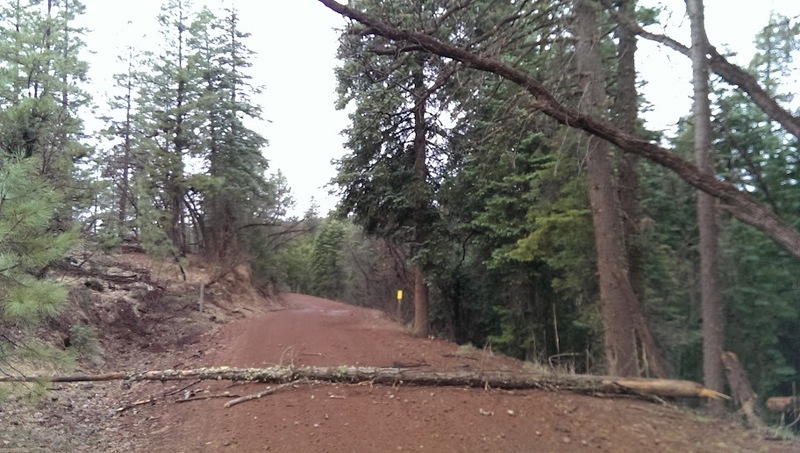 As we headed toward Thursday nights camping spot outside of Mormon Lake, Az, a downed tree blocked our way! Oh no! We found a nice spot to overnight and settled in. Friday travels took us through John Wayne country: Monument Valley. 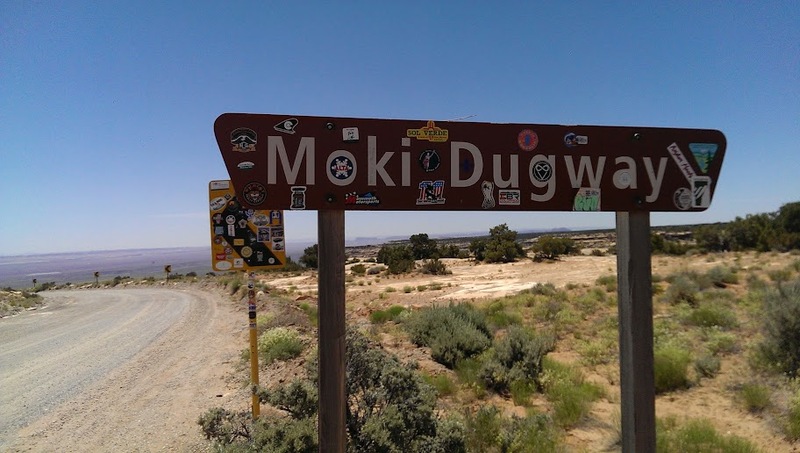 Fridays plan was to go up Moki Dugway (it was constructed in 1958 by Texas Zinc, a mining company, to transport uranium ore from the “Happy Jack” mine in Fry Canyon to the processing mill in Mexican Hat.) Instead, I decided to explore a bit. 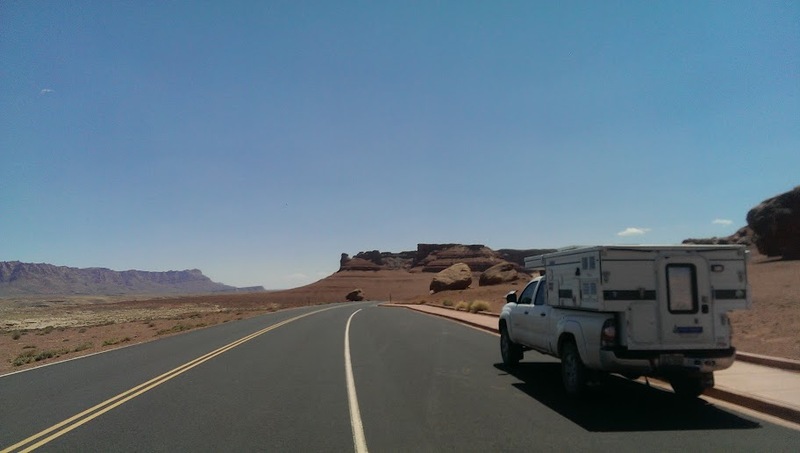 There is a road at the base of the climb up Moki Dugway called “Valley of the Gods Road”. How could I resist checking that out? The dirt road wound around and parallelish to a pretty major wash. Of course, I wouldn’t know about that until after I’d found a beautiful campsite. It’s wonderfully isolated. 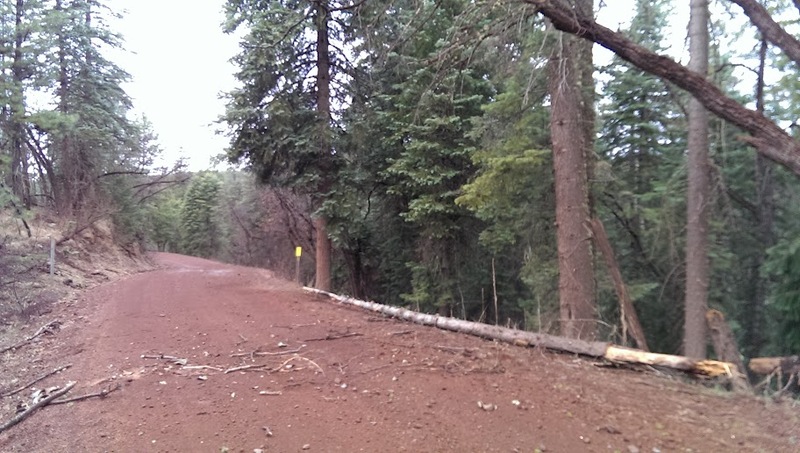 This was a dirt road off of the dirt Valley of the Gods road. I checked in with my mom, who mapped my location. She noticed a wash not far. I took Argos for a walk, and found it 100 feet away. After some consultation, and sky-watching, I decided to move camp lest I get washed away in a flash flood. 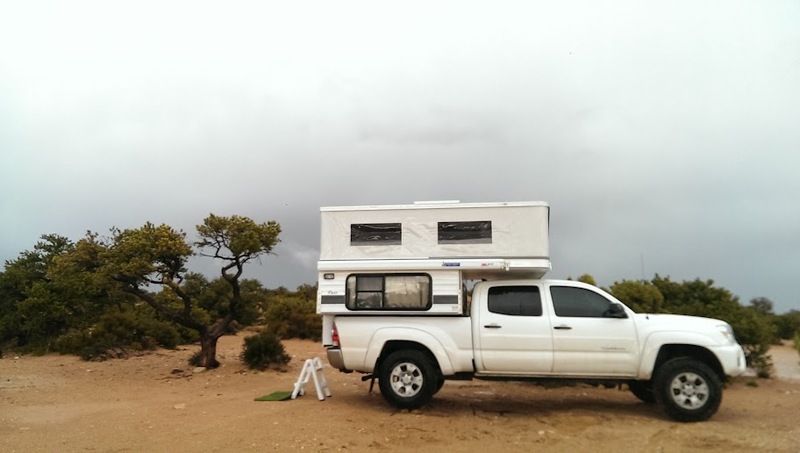 Mom recommended I camp up top of Moki Dugway. That sounded pretty fantastic, so up the crazy, scary switch-backs I drove. 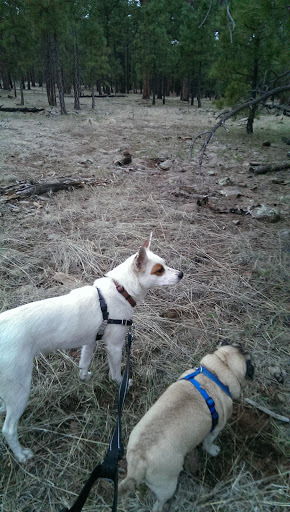 We took a pit-stop on the twisty-turny hair-piny road and Argos took survey of the land below. Unfortunately, as I drove up the Moki Dugway (SR261), a storm was approaching. My mom who has been there before was helping me navigate via phone. She instructed me to turn left down the dirt road off the SR261 and drive on it for three miles, where it would open up to an amazing view. The road did indeed open up to an amazing, and vertigo inducing, view. However, right after I got parked and camper set up, it started to rain. Then pour. The storm finally cleared, with enough daylight for me to enjoy the beautiful vista. That night, the wind blew something fierce, and I had imaginings of being blown right off of the cliff. It caused some pretty good anxiety. Luckily for me (not so much for my dear friend who was on the receiving end) I had cell service. We texted back and forth for a while and she sent me articles about how rare it was for a camper to actually blow over. And it would take some gale-force winds. Of course, in my mind, this was close to hurricane level, so I was only somewhat comforted. Finally, not long after midnight, the wind blew itself out and I was able to get to sleep. I woke up to a beautiful morning. 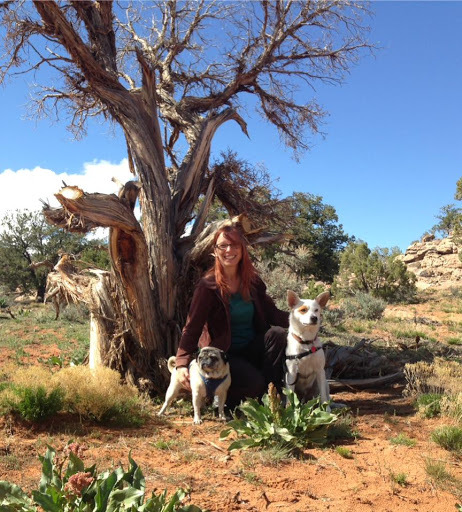 After breakfast and walking the dogs, I left to head north to meet a friend of mine outside of Moab. Unfortunately, while I was getting camp broken down, a dense fog rolled in. 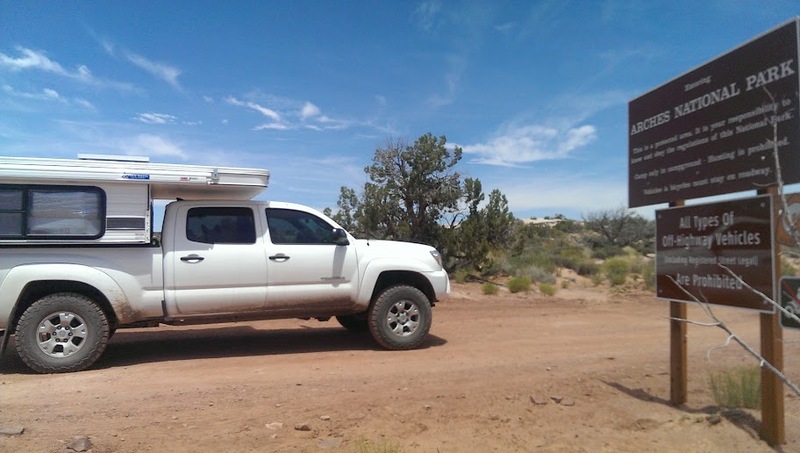 This weekend I had one job for this adventure up to southern Utah. 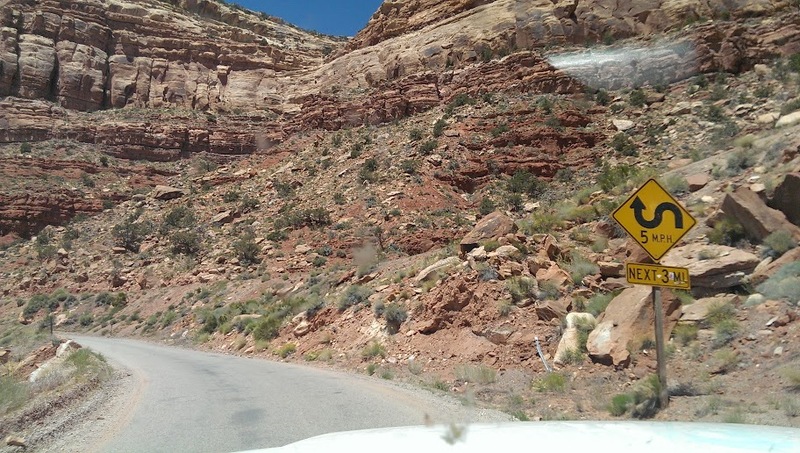 It was to trek up one of the most dangerous roads in the U.S. and get a photo of the sign to Muley Point. I left into the fog and kept watch for a sign for Mulay Point, but didn’t see any signs. I had one job. One stinking job…. Saturday morning meant visiting with my friend Melissa! When my plans changed suddenly last week, I scrambled to make new plans. Melissa lives up in Logan, Utah, and I thought she might be crazy enough to drop everything and meet me halfway-ish, so I sent her a note on Wednesday (I planned to leave my cottage Thursday after work). She was up for the adventure! However, because of work, she couldn’t leave until Saturday. 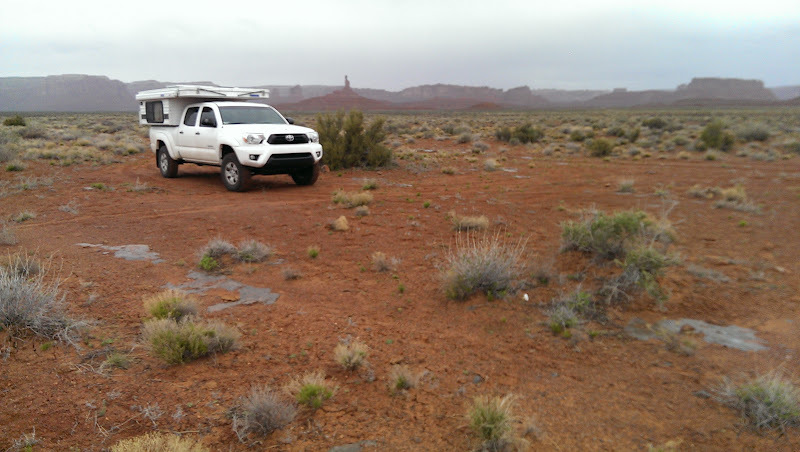 We arranged to meet at a rest stop about 30 miles south of Moab around 11am. That’s as far as our planning went. 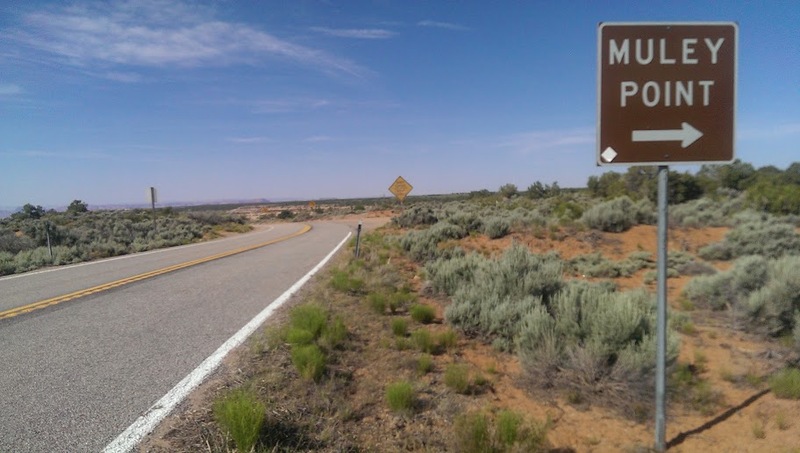 I left the Moki Dugway and had a very uneventful drive down the backside – still SR261 and drove North, East, then North again back on 191 towards Monticello, past turn offs for Canyonlands. It was difficult to drive by, but Canyonalands was for another day. Our meeting location was right next to Hole n” the Rock. Which isn’t near as interesting as I thought it would be. Well, it is pretty neat, but I thought there would be a hole. in a rock. Turns out, it was a home carved into the rock, and a tourist trap. Fortuitously, I had actually missed the turn for our meetup rest area and had to drive an extra 2.3 miles before I found a turn-around spot. I turned right into what looked like a trailhead for horse riders. 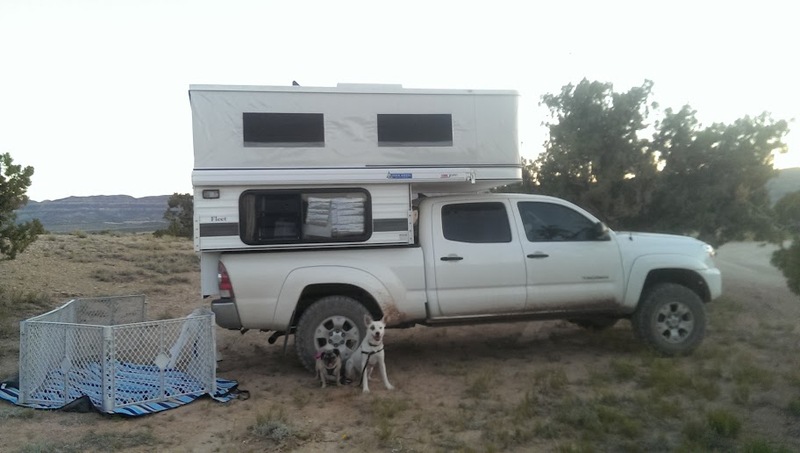 I did a u-turn in the parking area, and was getting ready to pull back on the highway when I saw a car with a camper trailer pulling out from a dirt road across the way. Curious…. 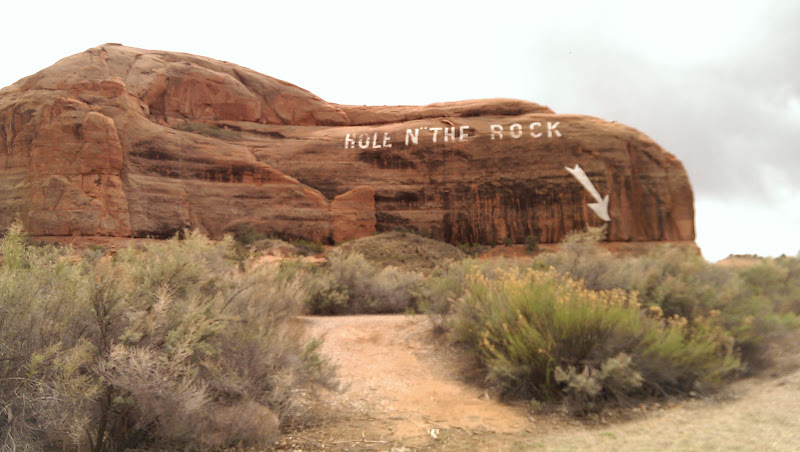 It was early afternoon by the time Melissa arrived at the rest stop next to Hole N” The Rock. I made some lunch and we took a walk through the sagebrush to see what this rock hole was. When we got back to our vehicles, it was later afternoon and we talked about where to camp. I mentioned the dirt road and so we left her car at the rest stop, and piled into my truck for a scouting mission. The dirt road was BLM land and appeared to be a popular OHV area. Kane Creek Canyon Rim. Past that “2 miles” of no camping, there were some nice camping areas! We saw a number of four-wheelers and dirt bikes riding around. 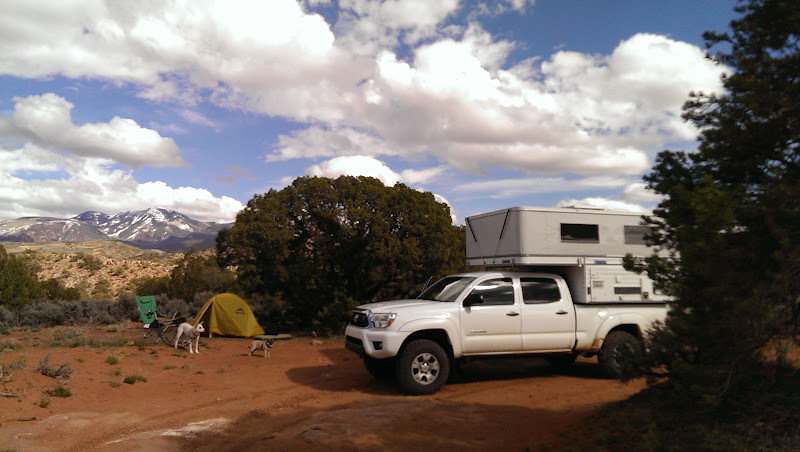 We also found a perfect camping spot with a gorgeous view of snow-capped mountains. Mount Peale? We had to retrieve Melissa’s car. What happens when you put two Chicagoans in the woods? 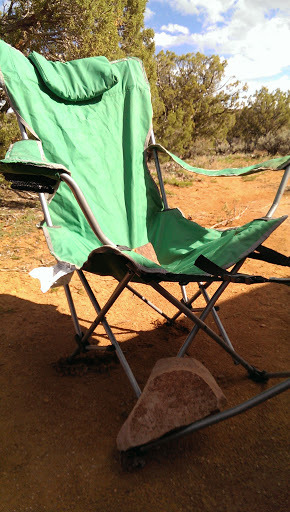 They save their camping spot with a chair, of course! 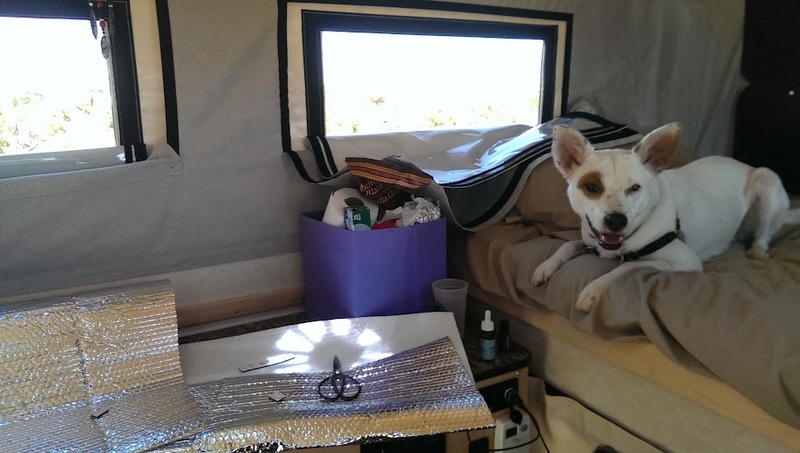 We got her car, and set up camp. I wish I had a picture that could capture how beautiful this spot was, but this is the best I got. 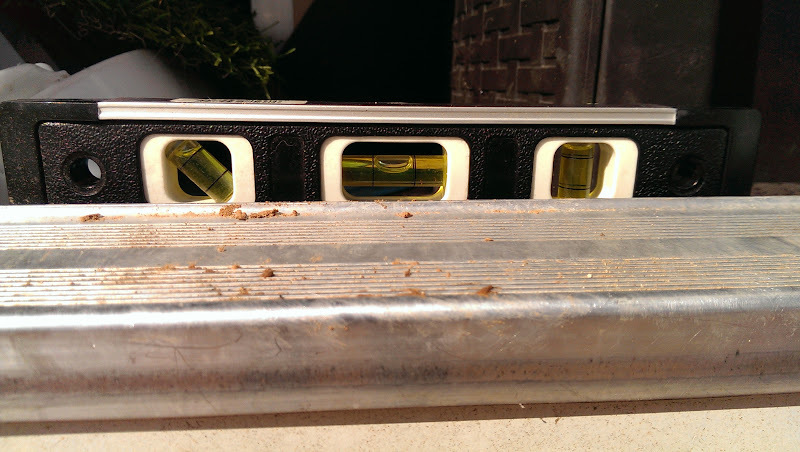 I’ve gotten to where when I pull the truck up, I can tell if it’s level – or close to it. This time, I was spot on! There was enough daylight left for us to explore the area some. Argos and Pugsly enjoyed getting out of the truck! After nightfall, it drizzled some, so we hung out in the camper, played cards, and enjoyed some single-malt scotch. We headed to our respective beds and slept soundly. Today, Sunday, was a driving day. After a freakishly good breakfast at Eklecticafe in Moab, UT (seriously, if you go to Moab, eat at this place. Enormous, delicious portions and super nice staff even with a line going out the door) we said our good-byes and headed in opposite directions. 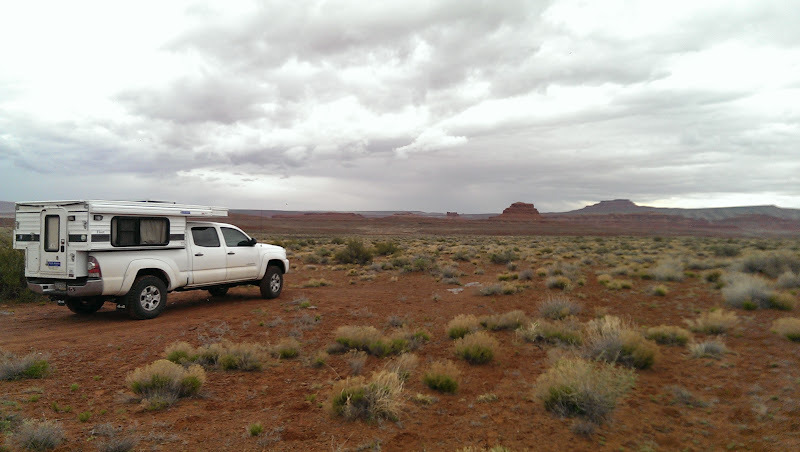 I didn’t make it to Arches, or to Canyonlands, but it’s foolish to try to jam that much into one long weekend. This was a fantastic trip, even with the night of insomnia due to fear of being thrown off a cliff by Mother Nature. There are so many places to boondock in these beautiful areas, I could easily spend weeks (or much more) exploring. One day….